Draft: 2006, Chicago Cubs, 5th rd. Married (Andrea)...they have two sons (Luca and Leonard James)...Met his wife Andrea backstage at a Pink Floyd concert in 2012. (She worked for the band. )...he got only her first name, so he had his brother, Sam, do some sleuthing to find out who she was and how he could contact her...a week later Sam had a name and address...Jeff sent her a handwritten letter with his phone number...she called and they "dated'' over the phone for two or three weeks before meeting in person in Chicago... they married February 13, 2015, near their home in Paradise Valley, AZ, with just 12 guests. Dealt with injuries all season, appearing in just 10 games for the Giants...His 10 appearances marked the fewest he's had in a single season since appearing in seven games in 2010...had made at least 30 starts in each of the past five seasons...Had never been on the injured list in his 10 big league seasons and in 2018 he landed on the injured list three different times with a right shoulder issue...missed a total of 118 games due to injury...Started the season on the injured list and missed San Francisco's first 18 games with a right pectoral strain...marked his first-ever stint on the injured list...made one rehab start with Class A Advanced San Jose on April 14 and allowed six runs on five hits in 2.2 innings...was activated from the 10-day injured list on April 20...Exited his start May 29 at Colorado after recording just three outs due to a tight right shoulder...underwent an MRI that showed inflammation and was placed on the injured list on May 30...Made four rehab starts with triple-A Sacramento, posting a 0-2 record with a 5.29 ERA (10er, 17.0ip) before being activated on July 7...missed 35 games...He was placed on the injured list for the third and final time on July 15 with right shoulder inflammation...saw team Orthopedist Dr. Tim McAdams and he recommended rest (no structural issues)...Started for double-A Richmond on August 22 and threw 4.0-scoreless innings, allowing just one hit and one walk...however, he felt pain during that start, so team doctors once again recommended rest...was shut down for the remainder of the season. Went 9-15 with a 4.42 ERA in 32 starts in his second season with the Giants...Among league leaders he ranked fi rst in innings pitched (207.1), tied for fourth in quality starts (20), sixth in strikeouts (205) and fi fth in WHIP (1.14)...Reached the 200.0 inning mark for the fi fthconsecutive season...joined the Nationals' Max Scherzer as the only pitcher in the Majors to throw at least 200.0 frames in each of the last fi ve seasons...Struck out 205 batters, reaching the 200 strikeout mark for the third time in his career (2013 and 2014)...Posted 6.41 strikeouts per walk, which ranked as the second-best mark in the NL (Clayton Kershaw, 6.71)...Faced a career-best 154 batters without issuing a walk from April 28-May 25...had four consecutive starts without allowing a walk from May 3-20, the longest such streak of his career and the longest by a Giants starting pitcher since Bill Laskey had fi ve starts from June 7-25, 1984...Samardzija walked the Padres' Jabari Blash on April 28 then went 154 batters without issuing a walk before giving one up to the Cubs' Ian Happ on May 25 at Wrigley Field...Allowed a career-high 30 home runs, which ranked as the fi fth-most in the NL...Surrendered 82 extra-base hits, which were tied for the fourth-most in the Majors...Was named the National League Player of the Week for the period ending Sept. 3...he compiled a 1-0 record with a 0.56 ERA (1er, 16.0ip) with 14 strikeouts in two starts. Made 32 starts in his first season with SF, posting a 12-11 record with a 3.81 ERA (86er, 203.1ip). Recorded a career-high 12 wins and reached 200.0 innings for the fourth-consecutive season. Went 7-2 with a 2.54 ERA (20er, 71.0ip) in his first 10 starts of the season...threw 7.0-or-more innings in six of his 10 outings, including four games with 8.0 innings. Struggled from May 30-Aug. 5 (12 starts), going just 2-6 with a 6.30 ERA (49er, 70.0ip) while allowing 12 home runs...his 6.30 ERA during this stretch was the third-highest in the NL. Pitched well over his final 10 starts of the season, posting a 3-3 record and a 2.45 ERA (17er, 62.1ip). Received two runs or fewer of support in 10 of his 14 starts following the All-Star break...overall, his 4.20 runs of support per game was the sixthlowest among National League starters. Induced opponents into 19 double plays, tied for the eighth-most among NL pitchers. Allowed 69 extra-base hits (37 doubles, eight triples and 24 home runs) this, which were the sixth-most among National League pitchers. Was masterful on June 17, tossing a complete-game four-hitter as the Giants defeated the Rays 5-1...he was one strike away from a shutout when Brad Miller drilled a 3-2 pitch for a shutout-spoiling homer. Had the longest no-hit bid of his career on Aug. 21 vs. New York-NL, tossing 6.0-hitless innings until a leadoff double by Curtis Granderson to start the seventh inning snapped his streak. Made 32 starts in his first season with the White Sox...eclipsed the 30-start mark for the third time in his career... Led the Sox in innings pitched (214.1) and tied witih Jose Quintana for the team lead in starts...his 163 strikeouts were the fewest since becoming a full-time starter...Became one of eight pitchers to record 30-plus starts, 200.0-plus innings and 160-plus strikeouts every season since 2013, joining Madison Bumgarner, Cole Hamels, Felix Hernandez, Jon Lester, Jose Quintana, Max Scherzer and James Shields....Posted an 8.16 ERA with 48 hits and five HRs allowed in the 1st inning...led Majors in 1st inning runs (31), ERs and hits...Made his third straight Opening Day start (also Cubs in 2013-14) in his White Sox debut on April 6 at Kansas City....Joined RHP Jaime Navarro (Cubs in 1996; White Sox in 1997-98) as the only pitchers to make an Opening Day start for both the Sox and Cubs....Was ejected following the 7th inning on April 23 vs. KC after the White Sox and Royals were involved in an on-field altercation...the ejection was the first of his career...received a five-game suspension from MLB for his actions (appealed suspension)....Allowed six runs in the 1st inning in a loss on April 29 at Baltimore...the game was closed to the public due to safety concerns in the area surrounding Oriole Park....Threw his second career shutout and sixth complete game on July 9 vs. Toronto...surrendered just four hits (all singles) and did not give up a hit until the 6th inning...was the first Sox to hold the opponent hitless through the first five innings in consecutive starts since Chris Sale from April 17-May 22, 2014 (also two)....Threw his seventh career complete game and third shutout on Sept. 21 at Detroit...allowed one hit, threw 88 pitches, faced 28 batters and did not go to a three-ball count...Victor Martinez's leadoff single in 5th inning was the only hit...His 88 pitches were the fewest in a 9.0-inning complete game in baseball in 2015 and were the fewest by a White Sox pitcher in a shutout since at least 1988, when pitch counts were first officially tracked (Elias)....Became the first pitcher to throw a shutout with four or fewer hits allowed after surrendering 10-plus runs in his previous start since the White Sox Bill Dietrich, who no-hit the St. Louis Browns on June 1, 1937 (Elias). Combined to go 7-13 with a 2.99 ERA (73 ER/219.2 IP), 202 strikeouts and a .234 opponents average (191-815) over 33 starts between the Cubs and Oakland...Recorded career highs in IP (219.2) and strikeout-to-walk ratio (4.70) and career lows in opponents on-base percentage (.279) and walks per 9.0 IP (1.76) … matched his career highs in starts (33), losses (13) and complete games (2)...Became just the sixth pitcher since 1919 to own a winning percentage of .350 or less with a sub-3.00 ERA (.350, 2.99), joining Al Benton (1942; .350, 2.90), Don Cardwell (1968, .350, 2.96), Sammy Stewart (1981; .333, 2.32), Nolan Ryan (1987; .333, 2.76) and Jim Abbott (1992; .318, 2.77)...Ranked among the major-league leaders in IP (T9th), opponents on-base percentage (10th), starts (T11th), strikeouts (13th, 202), strikeout-to-walk ratio (14th) and opponents average (16th, .234)...Was traded on 7/5 by the Cubs with RHP Jason Hammel to the Athletics in exchange for RHP Dan Straily, OF Billy McKinney, INF Addison Russell and a PTBNL or cash considerations...Was named to his first National League All-Star Team on 7/7, two days after the trade (was not eligible to pitch)...His 13 no decisions tied for third in the major leagues … bullpen surrendered a lead six times in his starts...Made five scoreless starts (all no decisions), allowed one run or fewer in 11 starts (three wins and eight ND) and worked at least 7.0 IP 21 times...Became just the sixth pitcher since 1914 to have at least five no decisions in a season when allowing zero runs...Received two runs of support or fewer in 19 of his 33 starts...His teams were shut out six times...Went 0-4 with a 1.46 ERA (11 ER/68.0 IP) over his first 10 starts (8 QS)...Made his second career Opening Day start on 3/31 at Pittsburgh, throwing 7.0 scoreless IP in a no decision...Extended his OD scoreless streak to 16.0 (since 2011)...Posted a ND on 5/5 vs. the White Sox despite allowing one unearned run on three hits over a career-high tying 9.0 IP...Earned his first win in his 200th career game on 5/26 at San Francisco (3 ER/7.0 IP), snapping a six-game and 16-start winless stretch since 2013 (sixth 10-plus strikeout game)...Went 1-1 with a 1.32 ERA (5 ER/34.0 IP) in five May starts...Led the majors in ERA during the month...Gave up eight runs in 3.0 IP on 6/1 at Milwaukee, the shortest start of his career … snapped a streak of 14 consecutive starts allowing three earned runs or less...Worked 7.0-plus IP in each of his first four starts with Oakland, the longest such streak by an Athletics pitcher since 1943...Won his A's debut on 7/6 vs. Toronto … recorded his fourth career complete game on 7/11 at Seattle (3-2 loss)...Lasted 6.0-plus IP for the eighth consecutive start on 8/14 at Kansas City, the second-longest streak by a pitcher to start his A's career since at least 1914...Struck out 10 over 8.0 IP in a win on 8/25 at Houston...Fanned nine without issuing a walk in consecutive losses on 8/30 at the Angels (complete-game, four-hitter) and 9/5 vs. Houston...Recorded a 2.25 ERA (9 ER/36.0 IP) with 37 strikeouts in September...Threw a career-high 16.0 consecutive scoreless IP from 9/5-17...Did not allow an earned run over 23.0 IP from 9/5-22...Made consecutive scoreless starts in no decisions on 9/10 at the White Sox (7.0 IP) and 9/17 vs. Texas (8.0 IP, 10 SO)...Became the first Athletics pitcher since at least 1914 to receive a ND in consecutive scoreless starts of 6.0-plus IP. Jeff set career marks with 33 starts, 213.2 innings pitched and 214 strikeouts in his second full season in the starting rotation for Chicago ... is the first Cubs pitcher to reach both 200 strikeouts and 200 innings since Ryan Dempster in 2010 (208 strikeouts, 215.1 innings) ... went 8-13 with two complete games, one shutout and a 4.34 ERA (103 ER/213.2 IP) in his 33 outings... His 19 quality starts ranked second on the club (Travis Wood, 24)... Spun two complete games, including his first career shutout, a two-hit effort, May 27 at the White Sox ... also went the distance, August 19 vs. Washington... Named N.L. Co-Player of the Week with Miami's Jose Fernandez for the period ending August 26 … was 2-0 with a complete game and a 1.59 ERA (3 ER/17.0 IP) in two starts ... walked two and struck out 12... Cubs were shut out in six of his 33 starts ... he allowed three or fewer runs in five of those six starts and two or fewer runs in three of those outings... Left four starts with a lead that the team would relinquish... Averaged 9.01 strikeouts per 9.0 innings pitched (214 SO/213.2 IP) ... walked 78 batters... Posted a 3.40 ERA (44 ER/116.1 IP) and went 6-4 in 17 night games... was 2-9 with a 5.46 ERA (59 ER/97.1 IP) in 16 day starts... Batted .113 (7-for-62) with two doubles, one home run and two RBI... Hit a go-ahead two-run homer in the second inning, May 15 vs. Colorado (Jon Garland)... Struck out a career-high 13 batters, April 7 in Atlanta … were the most strikeouts by a Cubs hurler since Mark Prior struck out 16, September 30, 2004 vs. the Reds... Punched out 11, June 1 vs. the Diamondbacks ... has five career 10-strikeout games... His 47 strikeouts in April were second-most in franchise history, trailing only Matt Garza's 51 strikeouts in April of 2011... Tossed 8.0 scoreless innings of two-hit ball in a 3-1 Opening Day win in Pittsburgh, April 1 … became just the second Cubs starting pitcher in the last 100 Opening Days to pitch at least eight innings while allowing two or fewer hits, joining Lon Warneke on April 17, 1934 (9.0 IP, CG, one-hitter in Cincinnati)... Suffered a career-worst, five-game losing skid, April 7-May 10 … was 0-5 with a 4.43 ERA (20 ER/40.2 IP) in seven starts during the span (two no-decisions)... Allowed a career-high tying nine runs and a career-high four home runs in 4.2 innings, July 10 vs. the Angels... Went at least 6.0 innings in eight of his final nine starts dating to August 13 ... recorded five quality starts in that stretch. In his first full season in the starting rotation for Chicago, Jeff went 9-13 with a 3.81 ERA (74 ER/174.2 IP) in a team-leading 28 starts ... made his final start, September 8, and was shut down after reaching 174.2 innings pitched, five more than he worked in his first four major league seasons, combined ... also led the team with 180 strikeouts...Tied for the team lead with nine victories (with Paul Maholm). ...Averaged 9.3 strikeouts per 9.0 innings pitched....Chicago went 14-14 in his 28 starts....Led the team with 17 quality starts....Was 4-4 with a 3.22 ERA (28 ER/78.1 IP) in 12 home starts ... was 5-9 with a 4.30 ERA (46 ER/96.1 IP) in 16 road outings....Posted a 2.49 ERA (20 ER/72.1 IP) and a .197 opponent batting average in 11 starts against the N.L. Central ... went 5-3 in those games. ...His 2.58 ERA (21 ER/73.1 IP) in 11 starts following the All-Star break was over two runs lower than his 4.71 ERA (53 ER/101.1 IP) in 17 starts in the first half....Recorded a 2.58 ERA (25 ER/87.1 IP) in his final 13 starts from July 2-September 8 ... that followed a stretch in which he had a 12.27 ERA (25 ER/18.1 IP) in four starts, June 9-27....Walked two or fewer in 21 of his 28 starts, including four no-walk outings....Received two or fewer runs of support while he was in the game in 10 of his final 12 starts....Recorded a 1.91 ERA (7 ER/33.0 IP) in five July starts....Threw at least 100 pitches in 13 of his 28 starts....Earned the victory, April 13 in St. Louis, to stretch his career-best winning streak to five games dating to August 4, 2011....Tossed his first career complete game in his final start of the season, a 4-3 victory in Pittsburgh, September 8 ... walked one and struck out nine while throwing a career-high 120 pitches....Batted eighth in the lineup....Batted .100 (5-for-50) with three RBI and seven sac bunts at the dish ... appeared as a pinch-hitter, May 6 vs. the Dodgers, and was hit by a pitch. Jeff made a career-high 75 relief appearances for the Cubs, posting a 2.97 ERA (29 ER/88.0 IP) with an 8-4 record, 13 holdsand 87 strikeouts...the eight wins are the most by a Cubs reliever since Lee Smith had nine wins in 1986...Held the opponent scoreless in 57 of 75 outings, including his last nineappearances (10.0 IP), September 6-27...Retired the first batter faced 55 times in his 75 outings...Tossed 2.0 or more frames 15 times, recording a 1.74 ERA (6 ER/31.0IP) in those outings...Fanned a season-high three batters nine times...Limited foes to a .200 batting average (64-for-320)...Owned a 2.79 ERA (13 ER/42.0 IP) in 37 appearances at Wrigley Fieldcompared to a 3.13 mark (16 ER/46.0 IP) on the road (38 outings)...Was 3-0 with a 2.23 ERA (9 ER/36.1 IP) in 36 games following the All-Star break...was 5-4 with a 3.48 ERA (20 ER/51.2 IP) in 39 contestsin the first half...Logged a 1.77 ERA (9 ER/45.2 IP) and a .196 average against (32-for-163) in his final 43 outings dating to June 28...Posted a 1-0 record with a 0.46 ERA (1 ER/19.2 IP) in 18 games vs.the N.L. East...Issued a career-high four walks (as a reliever), April 9, in the Cubs 6-0setback in Milwaukee...Enjoyed a 15.0-inning scoreless streak (11 appearances) from the fifthframe April 12-May 11's sixth inning before allowing three runs in theseventh vs. St. Louis...the streak was 0.1 innings shy of his career highset August 1-September 1, 2008...Surrendered a season-high five runs (three earned) in May 20's eighthinning in Boston...Didn't allow an earned run in 12 outings, spanning 12.1 innings, June28-July 23...Posted an 8.1-scoreless innings streak, August 13-25 (eight appearances)...Was 1-0 with a 1.13 ERA (2 ER/16.0 IP) in 16 August outings...Was unscored upon in his last nine appearances (10.0 IP), September6-27. Jeff broke camp with Chicago for the first time in his career, however, he spent a majority of the season with Triple-A Iowa ... alltold, he went 2-2 with an 8.38 ERA (18 ER/19.1 IP) in seven games (three starts) with the Cubs. ... Had a 6.00 ERA (8 ER/12.0 IP) with a 2-0 record in four road games(two starts) ... was 0-2 with a 12.27 ERA (10 ER/7.1 IP) in three homegames (one start). ... Started the campaign in the Cubs bullpen, going 0-1 with an 18.90 ERA(7 ER/3.1 IP) in four relief appearances. ... Tossed a season-high 2.0 innings of relief, April 15 vs. Milwaukee, allowingtwo runs on two hits, while walking two and fanning one. ... Optioned to Iowa, April 24, when Ted Lilly returned from the D.L. ... Recalled to Chicago, September 7, and made three starts for the club,going 2-1 with a 6.19 ERA (11 ER/16.0 IP). ... Picked up his first win of the season, September 13 in St. Louis, tossing5.2-scoreless innings of six-hit ball, while walking four and fanning one. ... Won back-to-back starts for the first time in his career by picking up hissecond win of the year, September 19 in Florida. ... With Iowa, went 11-3 with a 4.37 ERA (54 ER/111.1 IP) in 35 games(15 starts) ... struck out 102 and walked 67 while compiling a .786winning percentage. ... Won five-straight decisions, April 27-June 15, to begin his time at Iowa. ... Held the opponent to two earned runs or less in 20-straight appearances(three starts) to begin his Triple-A season, going 5-0 with a with a 1.88ERA (8 ER/38.1 IP) with 22 walks and 33 strikeouts (from April 25-June23). ... Allowed four or fewer hits in three-straight starts, July 16-26, going 2-0with a 1.13 ERA (2 ER/16.0 IP), while walking 12 and fanning 16. Jeff split the 2009 campaign between the Cubs and Triple-A Iowa ... he went 1-3 with a 7.53 ERA (29 ER/34.2 IP) in 20 games(two starts) for Chicago.... Had three stints with the big club: April 23-May 6, June 30-August 13and September 8 through the end of the season.... Was 1-1 with a 9.19 ERA (16 ER/15.2 IP) in 11 home games (one start)compared to a 0-2 record with a 6.16 ERA (13 ER/19.0 IP) in nine roadgames (one start).... Went 0-2 with a 10.80 ERA (10 ER/8.1 IP) in two starts compared to a1-1 mark with a 6.49 ERA (19 ER/26.1 IP) as a reliever (18 games).... Tossed 2.0 or more innings of relief five times, while hurling 3.0-plusframes for the Cubs three times.... Opened the season with Triple-A Iowa, posting no record and a 3.75 ERA(5 ER/12.0 IP) in three appearances (two starts) prior to his April 23recall.... In his first stint with the big club, April 23-May 6, he recorded no recordand an 8.10 ERA (3 ER/3.1 IP) in five relief outings.... He was recalled June 30-August 13 ... went 1-2 with a 7.77 ERA (21ER/24.1 IP) in 12 games (one start).... Earned his lone win of the season July 27 vs. Houston after tossing 2.0scoreless innings of relief, yielding a pair of knocks and walking one inChicago's 5-1, 13-inning victory.... Made his first career major league start August 12 vs. the Phillies ... wascharged with seven runs on eight hits, while walking none and fanningfour in 3.1 innings of work in the Cubs' 12-5 setback.... Recalled from Iowa prior to September 8's game after making the startSeptember 7 in Iowa's final contest of the season - went 4.2 innings (5ER) vs. Albuquerque.... Hit first big league homer September 23 in Milwaukee (Chris Narveson).... With the I-Cubs, was 6-6 with a 4.35 ERA (43 ER/89.0 IP) in 18 games,17 starts ... struck out 71 compared to 27 walks. Jeff made 26 relief appearances for Chicago, going 1-0 with one save and a 2.28 ERA (7 ER/27.2 IP) in his first major leagueaction after beginning the year at the Double-A level.© Posted a 0.95 ERA (2 ER/19.0 IP) in 15 outings at Wrigley Field ... hada 5.19 ERA (5 ER/8.2 IP) in 11 road games.© Did not allow a run in 13 August contests, spanning 14.1 innings of work.© Limited the opponent to a .226 batting average (24-for-106), includinga .167 mark (8-for-48) against left-handed hitters.© Promoted from Iowa July 25 and made his big league debut that day vs.Florida ... allowed one run in 2.0 innings of work.© Converted his first major league save after tossing 2.0 perfect innings ofrelief, fanning three, in July 27's 9-6 win over Florida.© During his season-high 15.1 scoreless innings streak, August 1-September 1, surrendered 10 hits, walked six and fanned 14.© Earned his first major league win after hurling 1.1 shutout innings August29 vs. Philadelphia, yielding two hits and two walks.© Recorded a 5.40 ERA (5 ER/8.1 IP) with no record in 10 Septemberrelief outings.© Prior to recall was 7-6 with 4.29 ERA (54 ER/113.1 IP) in 22 games (21starts) between Triple-A Iowa and Double-A Tennessee.© Was 4-1 with a 3.13 ERA (13 ER/37.1 IP) in six starts with Iowa ... hada 2.37 ERA (5 ER/19.0 IP) in his last three starts, striking out 25 andwalking five.© Prior to June 24 promotion to Triple-A, owned a 3-5 mark with a 4.86ERA (41 ER/76.0 IP) in 16 games (15 starts) with Double-A Tennessee. Jeff appeared in 30 games (26 starts) between Single-A Daytona and Double-A Tennessee in his second professional season,combining to post a 4.57 ERA (72 ER/141.2 IP), including a 3.41 ERA in six starts with Tennessee... Allowed two or fewer earned runs to score in 12 of his 20 starts at Single-ADaytona ... struck out at least one batter in all but one of his starts.... Tossed a 6.0-inning complete game August 1 at Palm Beach ... allowed justtwo runs to score on three hits, but was tagged with the loss in the contest.... Promoted to Double-A Tennessee August 2.... Tossed six solid games for Tennessee after his promotion, going 3-3 with a3.41 ERA (13 ER/34.1 IP) with nine walks and 20 strikeouts.... Won his first three starts with the Double-A club, posting a 3.12 ERA (6ER/17.1 IP) with five walks and 12 strikeouts in that span.... Worked a season-high 7.0 innings August 29 against Chattanooga ... taggedwith the loss in the contest, despite allowing just three runs to score (twoearned) on five hits. Jeff went 1-2 with a 2.70 ERA (9 ER/30.0 IP) in a combined seven starts at the Single-A level with Boise and Peoria... Started the year in Boise, making five starts and recording a 1-1 record witha 2.37 ERA (5 ER/19.0 IP) while striking out 13 and walking just six.... Finished the season in Peoria where he went 0-1 with a 3.27 ERA(4 ER/11.0 IP) in two starts.... Returned to the University of Notre Dame in August to fulfill his prior commitmentto the football team.... Named the fourth-best prospect in the Cubs minor league organizationheading into the 2007 season by Baseball America. October 29, 2018 San Francisco Giants activated RHP Jeff Samardzija from the 60-day injured list. September 4, 2018 San Francisco Giants transferred RHP Jeff Samardzija from the 10-day disabled list to the 60-day disabled list. Right shoulder inflammation. 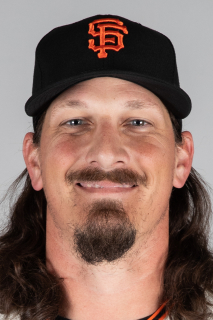 August 22, 2018 San Francisco Giants sent RHP Jeff Samardzija on a rehab assignment to Richmond Flying Squirrels. July 15, 2018 San Francisco Giants placed RHP Jeff Samardzija on the 10-day disabled list. Right shoulder inflammation. July 7, 2018 San Francisco Giants activated RHP Jeff Samardzija from the 10-day disabled list. June 15, 2018 San Francisco Giants sent RHP Jeff Samardzija on a rehab assignment to Sacramento River Cats. April 20, 2018 San Francisco Giants activated RHP Jeff Samardzija from the 10-day disabled list. April 14, 2018 San Francisco Giants sent RHP Jeff Samardzija on a rehab assignment to San Jose Giants. March 29, 2018 San Francisco Giants placed RHP Jeff Samardzija on the 10-day disabled list. Pectoral strain. December 9, 2015 San Francisco Giants signed free agent RHP Jeff Samardzija. November 2, 2015 RHP Jeff Samardzija elected free agency. May 11, 2015 Chicago White Sox activated RHP Jeff Samardzija. May 6, 2015 RHP Jeff Samardzija roster status changed by Chicago White Sox. October 2, 2014 Oakland Athletics activated RHP Jeff Samardzija. September 30, 2014 Oakland Athletics reassigned RHP Jeff Samardzija to the minor leagues. September 7, 2010 Chicago Cubs recalled Jeff Samardzija from Iowa Cubs. April 24, 2010 Chicago Cubs optioned Jeff Samardzija to Iowa Cubs. October 6, 2009 RHP Jeff Samardzija assigned to Aguilas de Mexicali. September 8, 2009 Chicago Cubs recalled Jeff Samardzija from Iowa Cubs. August 13, 2009 Chicago Cubs optioned Jeff Samardzija to Iowa Cubs. June 30, 2009 Chicago Cubs recalled Jeff Samardzija from Iowa Cubs. May 6, 2009 Chicago Cubs optioned Jeff Samardzija to Iowa Cubs. April 23, 2009 Chicago Cubs recalled Jeff Samardzija from Iowa Cubs.